The Arbiter Systems®, Inc. Model 1040C and 1040CU Panel Meter Calibrator (PMC) integrates eight calibration functions: voltage, current, frequency, power, power factor, phase, reactive power (VARs), and synchroscope into one compact, portable package. The units are designed to easily calibrate virtually every type of panel meter and many types of transducers, circuit breakers and overcurrent relays. Model 1040C includes a hand-held control allowing operation at a distance when calibrating panel meters in the control room or substation. The Model 1040C’s precision ac/dc voltage and current sources may operate independently to calibrate voltmeters, ammeters and frequency meters, or together to calibrate watt meters, watthour meters, power factor meters, VAR meters, and phase meters. The Model 1040C is also an excellent source for calibrating high-accuracy transducers and revenue meters, when used with an external standard. 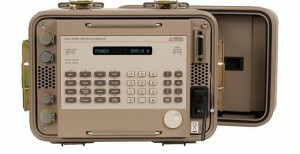 The Model 931A Power System Analyzer is a good companion instrument for these tests, with basic accuracy of 0.05 % and 0.05 °, built-in transducer output measurement capability and timer. The Model 931A also performs a wide variety of other measurements. Together, these two instruments can calibrate and measure the vast majority of your work load requirements. The lower-priced Model 1040CU offers all of the same performance and features as the 1040C, but it has binding post outputs instead of detachable output cables, and it has no hand-held control unit. There is also no storage compartment in the unit’s lid, and the maintenance manual is optional. For applications which do not require these features, the Model 1040CU offers significant savings. Note: Internal voltage ranges have full-scale (FS) values of 105 mV, 1.05 V, 10.5 V, 105 V, and 1050 V (dc), and 15.75 Vrms, 157.5 Vrms, and 750 Vrms (ac). Synchroscope Output is connected to the Voltage Output with a selectable 0 ° or 180 ° phase relationship. The total burden of both outputs must not exceed specification. Note: Internal current ranges have full-scale (FS) values of 1.05 mA, 10.5 mA, 105 mA, 1.05 A, and 10.5 A (dc), and 1.05 Arms, and 7.5 Arms (ac). Stability ≤ (0.06 % setting + 0.03 % FS) averaged one minute or longer. Note: Full-Scale (FS) value determined from full-scale values of voltage and current ranges being used. Other ac power specifications are derived from the individual specifications for current and voltage. Hand-Held Unit (1040C only) Store, recall, up, down, operate, standby, normal and % deviation keys.